1.2 Silver 5dr 1 OWNER FSH. Now owned by the Fiat Group with all the added benefits that this alliance brings, Chrysler has launched two new models; the Delta and the Ypsilon, both of which have been sold under the Lancia badge in Europe. The Ypsilon first arrived on the UK's roads in 2012, before undergoing a revamp in 2014. It’s a small, urban car that has the same base platform as the Fiat 500, making it a fair bit smaller than most of its rivals. What’s more, it comes in both diesel and petrol and a range of engine sizes, too. 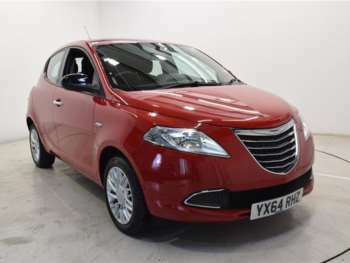 Aimed at the more luxurious end of the market, the Ypsilon has an array of extra features not normally associated with these smaller cars. The mix of cutting-edge technology, pretty styling and world-class engines make this a fantastic used buy. The entry-level S comes with a good standard range of equipment including 50/50 split seat, 15-inch wheels, fully adjustable driver's seat, premium upholstery and CD/MP3 player along with a full complement of safety features. The SE level adds in Castiglio upholstery, manual climate control and electronically controlled door mirrors among other things. The Limited version swaps fabric for leather, has 15-inch alloys and electric rear windows. With their eye firmly on the upper end of the market, Chrysler has also made a range of other options available including a full range of paint options including bi-colour along with 16-inch alloys, cruise control, automatic climate control, dusk/rain sensors and a surround sound system. Other smart technologies that you opt for include Smart Fuel system, Magic Parking and Blue&Me. With the lumpy, bumpy state that the UK's roads are in the Ypsilon's suspension can feel a little too firm. It is easy to drive though, which is why a Ypsilon should represent a cheap and relatively reliable second-hand purchase in its class. It comes in three engine sizes, including the 1.3l Multijet, TwinAir and 1.2l FIRE. Each one is great and offers a comfortable yet sturdy ride.